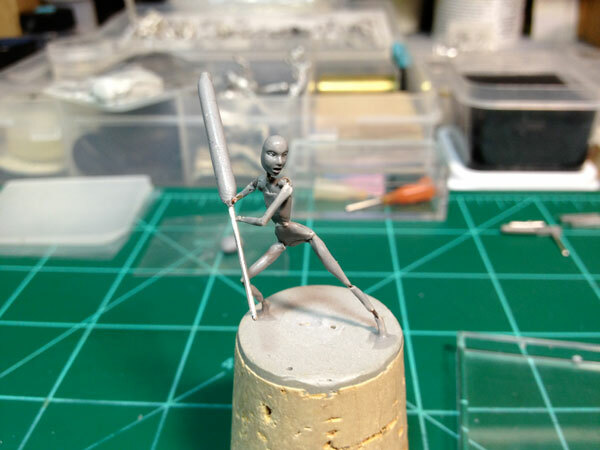 Here I will be making a single-edged blade for the Linna Babe™ for Bombshell Miniatures. Ordinarily I use the same method for each sword I sculpt. They may be shaped differently but it is essentially the same process. I usually will make the weapons first before actually sculpting anything on the figure it will be attached to. Making weapons is one of my less favorite things, so I usually try to get that out of the way first. I start by making an armature for the sword. 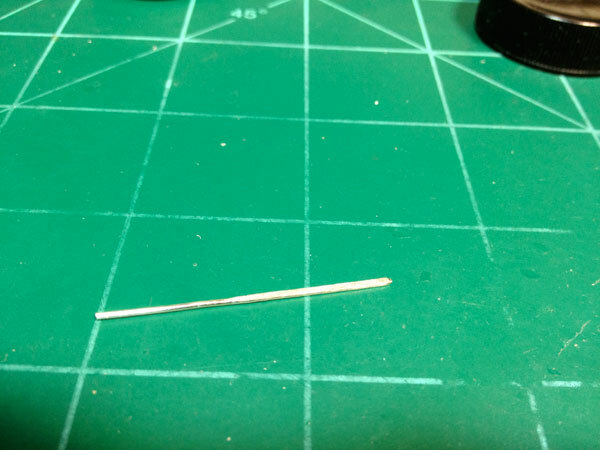 I will either use thin brass rod or in this case 24 gauge silver-plated beading wire. I usually cut a section about 1/2" longer than I need to give me something to handle while working on it. I pound this flat against a hard surface with a small hammer. 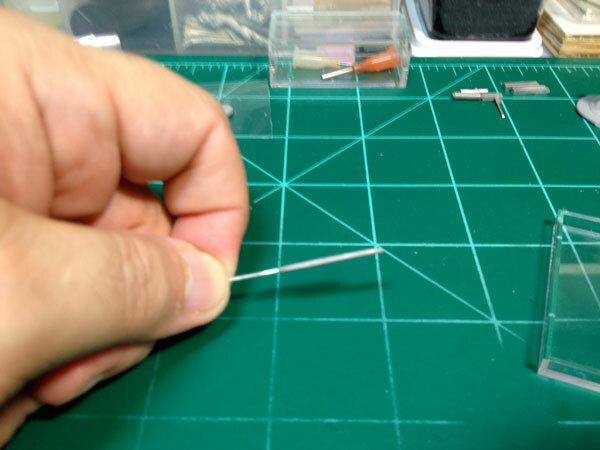 Flattening the wire lowers the profile of the blade and helps keep the wire from coming through whenever filing the blade down later. This will still happen sometimes and is unavoidable. 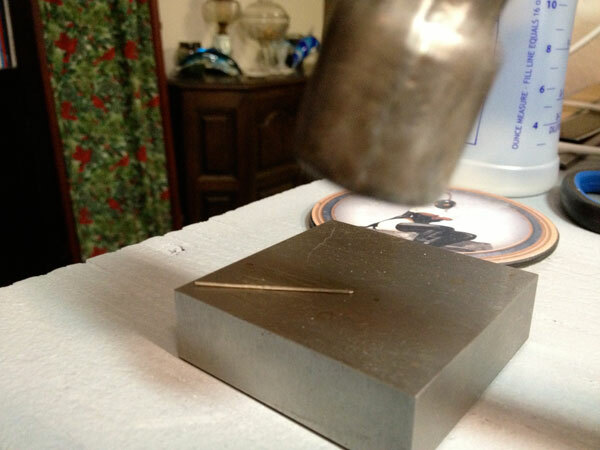 Once the wire is flattened, I shape the tip to a tapered point so that it will allow for a point on the sword. I use two kinds of material for sword blades. It is a 50/50 mix of ProCreate and Aves Apoxie. You can get similar results by mixing equal parts of greenstuff (or Duro) and brownstuff, or mixing greenstuff with milliput. 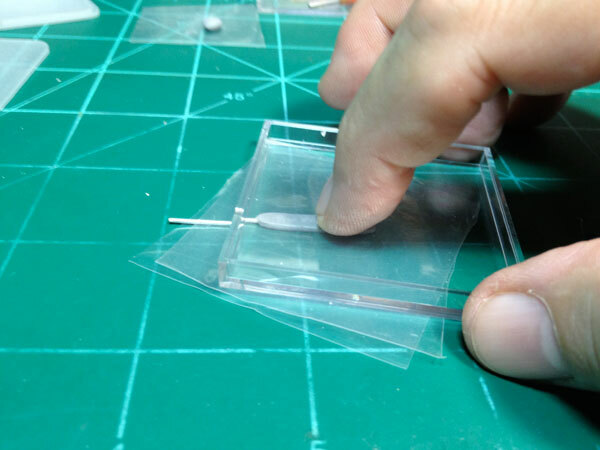 I also like to keep the mixed putty on these plastic dividers that come in Plano storage boxes. You can also use scraps cut from plastic milk jugs just as well. The benefit if mixing the two types of putties gives the blade material the most desirable properties of each kind of putty. The Aves give the blade strength and rigidity since it is a hard-surface you are trying to replicate. 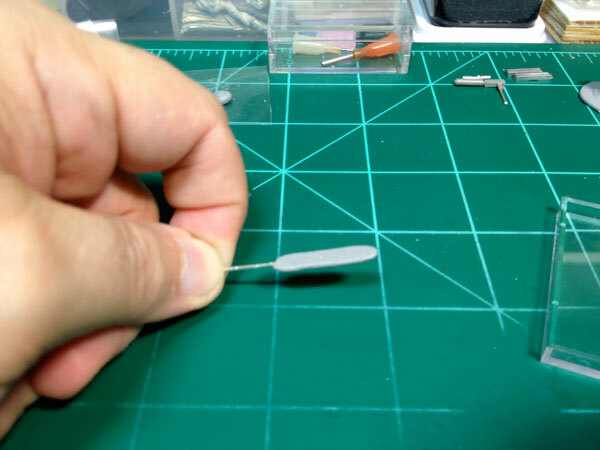 This allows for precise filing and scraping giving sharp edges. However, with the ProCreate, there is still an element of flexibility to it that makes it less likely to crack or crumble while being shaped after curing. The putty is then rolled to length. 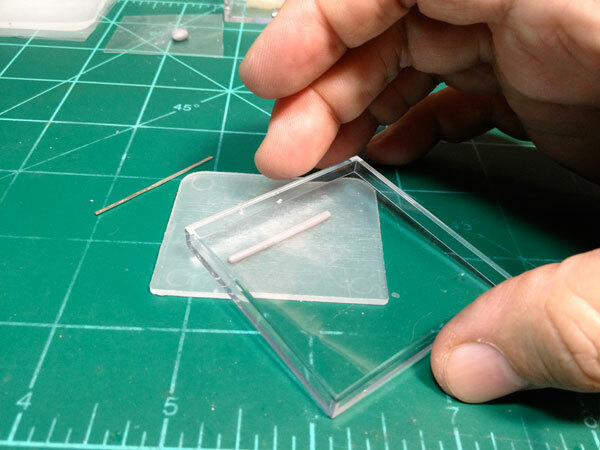 I like to use the clear lid of a small plastic box so I can see how thick the rod is and to make sure it is rolled out evenly. 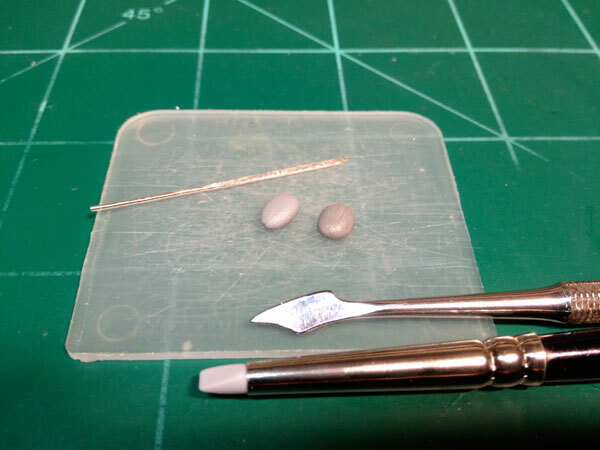 This rod of putty is then wrapped around the flattened portion of the wire. 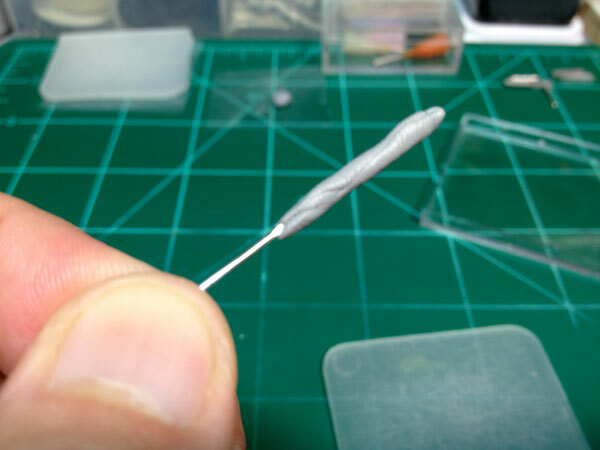 I make sure to leave a little putty extending beyond the end of the wire in order to shape the tip of the weapon. 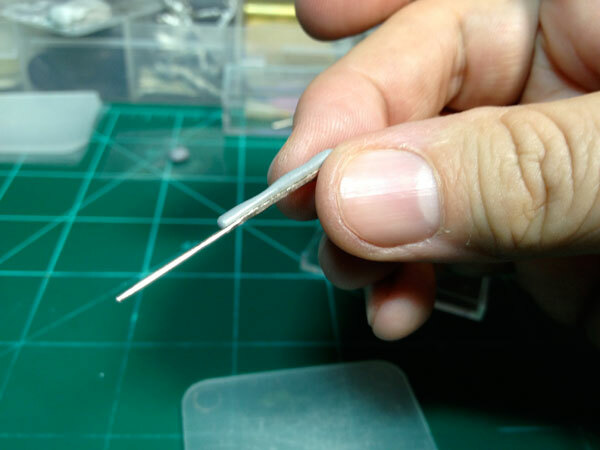 Here I check the proportions and length of the blade to make sure it is the right size. If I am working on weapons without the benefit of the actual armature it will be attached to, i will size it up next to a comparable figure for reference. To smooth out the blade, I roll the part under the plastic lid again. 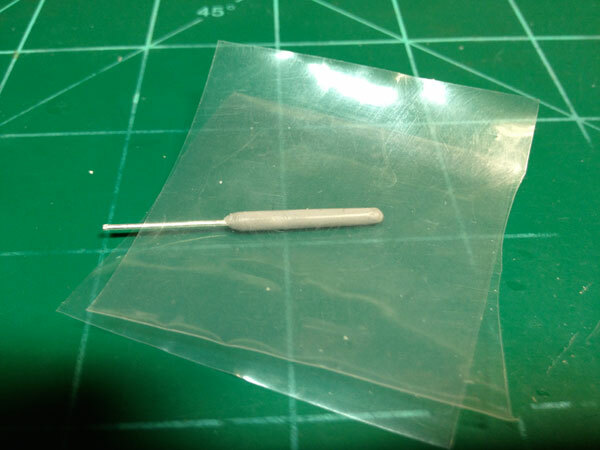 Here, the blade is placed between two pieces of plastic. These are cut from 4 mil plastic bags, but you can use freezer bags, comic bags, or other thick plastic sheeting as long as it is flexible. 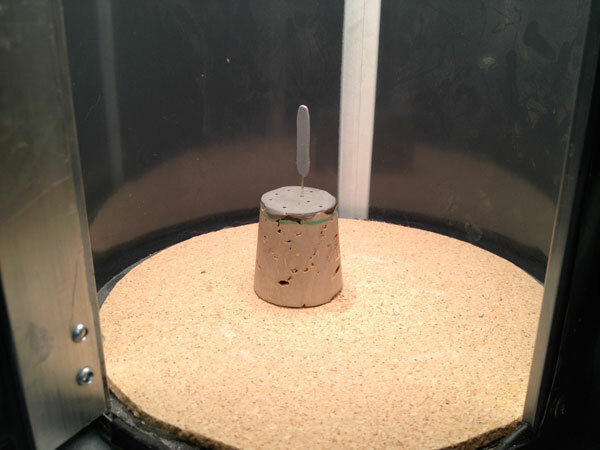 This will keep the putty from sticking to the surfaces it will be pressed against. The sandwiched plastic and blade are pressed under the lid. With a quick ripping motion, the plastic is peeled away from each side of the blade. You can see it is flattened but not pressed all the way down to the wire. 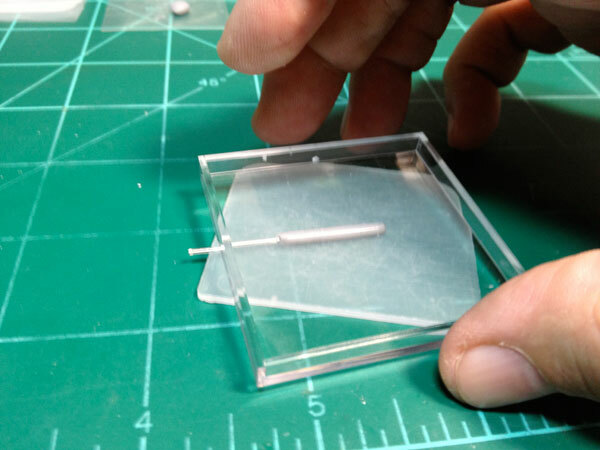 Sword blades should be at least 1mm thick in order for them to properly cast into a production mold. 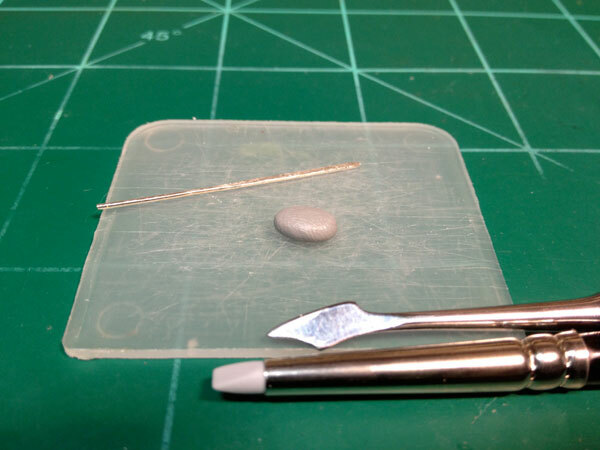 The blank for the sword blade is placed in the "putty oven" for curing. This is basically a 1 gallon aluminum paint can with a lamp attached to the top. With a 60 watt light bulb, the temperature gets up around 200° F. This is enough to cure the putty fully in 15 to 20 minutes rather than 2 - 4 hours. This ends Session 1 for making the blade. Next it will be shaped and detailed in Session 2.